Mother of God, Joy of All Who Sorrow is the name of at least three well-known wonderworking icons of similar design. On October 24, the Church commemorates the icon of the Mother of God, Joy of All Who Sorrow of Moscow. A woman named Euphymia (sister of Patriarch Joachim) received healing from sickness after obeying a voice telling her to find this icon and have the priest celebrate a Molieben with blessing of water. This miracle occurred on October 24, 1688. On July 23, the Church commemorates the icon of the Mother of God, Joy of All Who Sorrow of St. Petersburg. This icon was glorified in 1888 when the chapel it was located in was struck by lightning. Miraculously, this icon survived despite all else being burned, and twelve coins from the poor box became attached to the icon. On November 19, a third icon of similar name and design is commemorated. There is also an akathist to the Theotokos, Joy of All Who Sorrow. 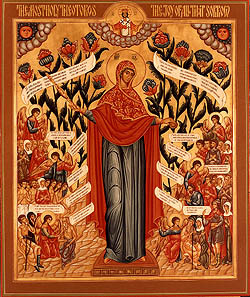 The design of this icon depicts the Theotokos, a most beautiful blossom of heaven, standing among the flowers of paradise. Her Son is visible above her in the clouds, the King of heaven and earth. Along both sides of the icon, framing the Mother of God, are suppliants (us), asking for her intercession. She stands with her arms spread open and her head tilted as if listening. The tenderness and kindness of a loving mother are evident in her face. She stands in paradise and yet among us. Metropolitan Neophytus, a bishop belonging to the see of Constantinople, was traveling through Volhynia in Ukraine where he was given hospitality by a pious woman, Anna Goyskaya. The bishop gave this woman an icon of the holy Theotokos, which began to work miracles, including the healing of her blind brother. In 1597 the icon was given to the monks residing in Pochaev near the border of Galicia, where the Mother of God had appeared in 1340, leaving an imprint of her footprint in the rock, from which a stream gushed forth. In 1675 when the Lavra of Pochaev was besieged by the Moslem Turks, it was saved by the miraculous intervention of the Mother of God through her wonderworking icon. Even though the Lavra of Pochaev came into Uniate hands for over a century, miracles continued to be worked through the holy icon. Since its return to the Orthodox Catholic Church in 1831, the icon has been a grace-bestowing support for Orthodox Christians, especially those in western Ukraine and the Carpathian region. The theology in this icon depicts the Theotokos as also being our mother, who feels our pain. It is believed, by Orthodox Christians, that she intercedes for us, bringing our pain into her Son's presence. She is praying our prayers with love, bringing our needs into the unique relationship that a mother shares with her children. She is our joy, because in her love she hears us. Her unceasing intercession and her limitless love help heal our sorrows. Her icons that have names like “The Joy of All who Sorrow” (“Vsekh Skorbiashchikh Radost”), “Ease my Sorrows” (“Utoli moia pechali”), “Intercessor of Sinners” (“Sporuchnitsa greshnykh”), “Comfort in Griefs and Sorrows” (“V skorbiakh i Pechaliakh Uteshenie”). An account of the story behind the icon commemorated on October 24, from the Prologue of Ohrid. This page was last edited on October 15, 2009, at 23:10.